Gokyo is a pretty little village nestled between a turquoise lake and the edge of the glacier. It’s the furthest and highest permanent settlement in the valley, and used to be nothing more than a summer pasture for local herders. It’s still quite undeveloped with only a few lodges. We woke up early the next morning to climb Gokyo Ri, a steep local mountain with incredible views from its peak. It was a perfect morning as we slowly ascended the switchbacks – the clouds came up the valley but quickly burnt off to afford us some incredible views. Sunrise en route up to Gokyo Ri. At the summit we had what I would have to say is the most AMAZING view I have ever experienced (and I’ve seen some goodies!). North of us stood Cho Oyu, one of the world’s few 8,000m peaks, and beyond that we could see some of the mountains of Tibet. The panorama extended to the east where we had our first unobstructed views of Mount Everest. It was a fantastic moment to see the mountain we’d come so far to see, and great to share it with my Dad! 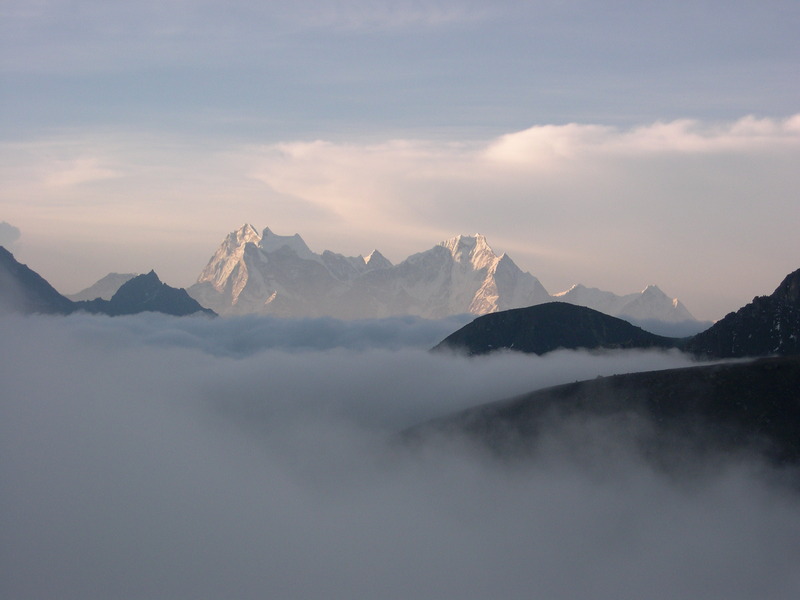 We could also see Lhotse and other mountains around Everest. Below us we could see the massive glacier that carved the valley, and we had great views to the south towards the lakes that we’d walked past on our way in to Gokyo. Cho Oyu (the world’s eighth highest mountain) at left. Kumar, Shiva, Dad and myself, with Mount Everest in the clouds in the distance. The next day we teamed up with Tammy and Claire, some of the other trekkers we’d got to know, and together we hiked further up the valley in search of the “Fifth Lake” for what we’d been told were some other great views of Everest. We walked along the moraine and heard a lot of rock and ice falls on the glacier. Unfortunately the clouds never burnt off and there wasn’t much to see at all!